What are leadless pacing systems? Leadless pacing system is a novel technology in the cardiac pacemakers market. These are smaller in size than conventional pacemakers along with the absence of leads thus eliminating potential lead and pacemaker pocket related complications but the use of these devices is limited for single-chamber ventricular pacing as observed in the case of permanent atrial fibrillation, sinus node dysfunction and atrioventricular block. The implant is considered a less invasive approach for patients requiring pacemakers as it does not require surgery like in traditional pacemaker procedures. These devices are implanted through a vein passing close to the outer surface of the upper thighs. Retrieval of this device is also possible without complications as observed in various clinical studies. High implant success rate as per various global clinical trials has also been observed such as 97% & 95.8% implant success rate of St. Jude’s Nanostim in the leadless and leadless II trial respectively. The estimated market for leadless pacing systems is estimated to be valued at US$ 29.4 Mn in 2017 and is projected to grow at a CAGR of 10.0% during the forecast period. Market for leadless pacing system products is limited with only 2 commercially approved products: Nanostim leadless pacing system by St. Jude’s Medical (now Abbott) and Micra Trans catheter pacing system by Medtronic plc. Product approvals for leadless pacing systems is a major factor impacting market growth. Companies are focusing on acquisitions, product approvals from various regulatory bodies and technical advancements for staying competitive in the global market. 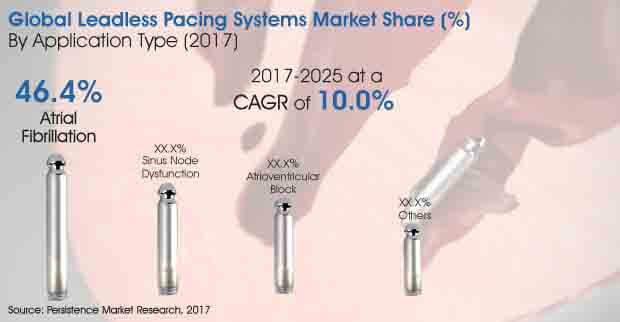 The global leadless pacing systems market is mainly driven by a rise in the number of eligible patients, increasing reimbursement scenario, rising disposable income, preference to new technology, growing geriatric population, rising number of cardiovascular diseases, and increasing number of medical insurers. Along with this, several technological benefits also support the market growth such as less invasive approach, long battery life, relief from frequent pacing etc. Certain factors such as strict regulatory approvals, high product cost, limited operators with hands on experience, battery depletion issues restricts the market growth for leadless pacing systems. There are a lot of opportunities available for companies to improve their product penetration in the market such as development of dual chamber and multi chamber pacing, providing professional education & training, distribution reach etc. Based on application type, the market for leadless pacing systems has been divided into atrial fibrillation, sinus node dysfunction, atrioventricular block and others. Atrial fibrillation segment dominates the leadless pacing systems market by application (as observed in various historical implants performed) with around 55% market share and is expected to remain dominant over the forecast period. This is followed by sinus node dysfunction application segment and atrioventricular block application segment respectively. Based on end users, the market has been segmented into hospitals and ambulatory surgical centers with hospitals dominating the global market because of more procedures performed in hospitals for leadless pacing implants than ambulatory surgical centers as per the trend observed in patient preferences over the globe. Regionally, North America holds the maximum market share in the global leadless pacing systems market followed by Europe because of higher demand in these regions, product affordability and a favorable reimbursement scenario. Middle East & Africa represents a significant market size in the global leadless pacing systems market as per the historical acceptance in the procedures for leadless technology over traditional pacemakers. The Asia Pacific market also represents a substantial growth rate over the forecast period owing to the rising healthcare burden and continuous advancement of healthcare facilities. Latin America holds the least market size and growth rate in this market and is projected to continue to do so over the forecast period.